Everyone will love this beautiful soft-scoop sorbet, and no one will guess it took less time to make than a cup of tea! 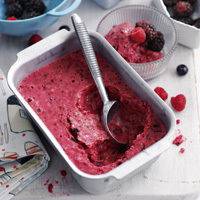 Put the frozen berries and bananas into a food processor or blender. Add the yogurt, sweetener and vanilla extract and blend for 1-2 minutes or until you have a ready-to-serve soft-scoop sorbet. Serve in chilled dessert bowls, with your favourite fresh berries scattered over.